Feel at Ease With Our ERP Software Solution. Improving Productivity & Workflow. For a Free 14-Day Trial, click here! A Full Featured Enterprise Resource Planning System Designed to Manage and Streamline Your Entire Business from Start to End. 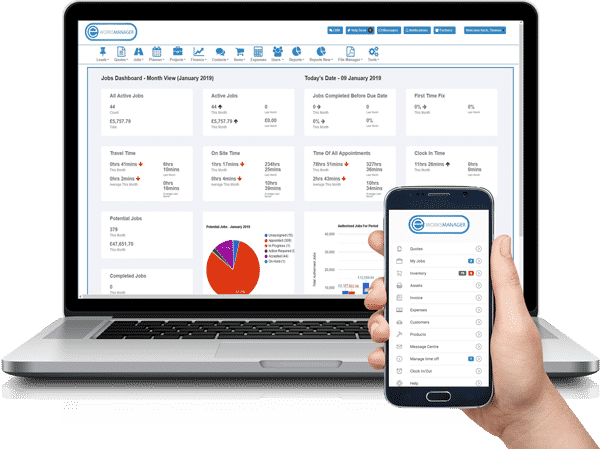 Are you a maintenance company looking for an all in one ERP software solution to manage your jobs, sales, staff and manage an all-round business? If so, Eworks Manager has the perfect solution for you! View customer invoices, credit notes, expenses etc. Manage stock control, warehouse process, deliveries, collections etc. Above are just a few benefits our ERP System has to offer to improve overall processes, workflow and productivity. We would love to have chat and discuss why we think our all in one Enterprise Resource Planning software is the best for you and your business. Try it for yourself with your 14-day free trial of the software, or free online demonstration. ERP stands for Enterprise Resource Planning. This type of software is built around business processes, allowing you to manage multiple operations which keeps your business organised in an all in one system. An ERP system comes with several different integrated applications to manage certain aspects of the business. These areas include Sales, Purchasing, Human Resources, Customer Relationship Management, Inventory Management and many more. ERP Software encourages the use of one system. This reduces the time double capturing, the hassle of monitoring multiple systems and makes sure important documentation or information is not misplaced. The aim for our ERP Solution is to make you feel at ease having all your information in one place, to improve work productivity, grow profit and view your business at a 360° angle.